I’ve had periodic relapses of Carpal Tunnel Syndrome over the years. The first was in mid-1991, while storyboarding on the first season of Batman. The second was in the early 1993 while drawing this second installment of “The Mark”. Actually it wasn’t brought on by drawing but by riding my bicycle to the corner store. Apparently the awkward position of my grip on the handlebars was the trigger I needed to set off another painful period that lasted the rest of the year. Following the recommendation of friends, I tried three different chiropractors, a biofeedback trainer and, a masseuse. All of these were on the west side of Los Angeles or in Santa Monica, 10 miles away from my home in the Elysian Valley Neighborhood Council District of Los Angeles. I was making this commute at least 3 times a week for several months until my second chiro took pity on me and referred me to an associate half a mile from my house. 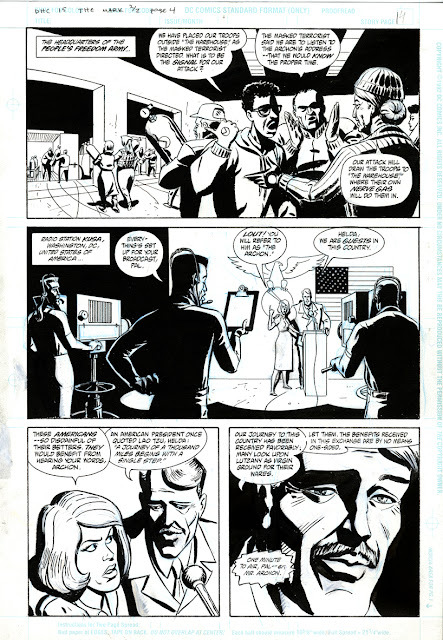 This is page #4 from Dark Horse Comics #15, “The Mark: What Goes Around”, written by Mike Barr, drawn by Brad Rader, published in December, 1993.